Vegans with a taste for cheesecake may feel like it's impossible to make a good raw vegan cheesecake. Actually, there are many ways to make this tasty treat without giving up your vegan lifestyle. Follow these simple instructions to make a delicious "cheese" cake that not only fits into your vegan lifestyle, but is a raw food, to boot. This recipe relies on the textures and flavors of buttery nuts like macadamias and cashews to mimic the taste of the cheesecake you've always loved. This recipe includes a crust and topping options. If you prefer a no-crust cheesecake, just eliminate these ingredients and steps. Follow these simple directions to make some of the best "cheese"cake in your life. Place macadamia nuts in a bowl with enough water to just cover the nuts. Let them sit at room temperature for thirty to sixty minutes. Next, make your crust by putting all crust ingredients into a food processor. Process until ingredients are well combined and stick together slightly. If they do not stick, add more raisins or dates. Spoon the crust into a glass dish and pat down with a spoon until well-packed. Place nuts, lemons (seeds are fine), and agave nectar in the food processor. 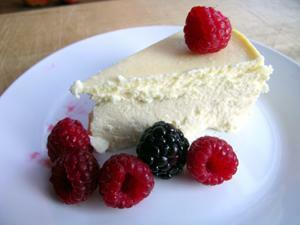 Process all ingredients until the texture is fluffy and creamy, like typical cheesecake. Pour "cheesecake" batter over the crust. Cover with plastic wrap. Place in the freezer for about twenty minutes, so it can set. Many people like to top their cheesecakes with that little extra something. Here are a few topping ideas to take your raw vegan cheesecake over the top. Fresh berries - Strawberries and blueberries both make excellent choices. Pureed fruits - Freeze bananas, mangoes, or raspberries. Drop your frozen fruit into the food processor and blend until you reach a fluffy consistency. Smooth over your cheesecake and serve! Agave nectar drizzle - Simply drizzle a little agave nectar over the top of your cheesecake. You can also sprinkle a few chopped cashews, walnuts, or more macadamia nuts over the top. Many of your favorite desserts can still be incorporated into a healthy vegan lifestyle. All it takes is a little creativity in the kitchen.